Swordfish (Xiphias Gladius) - No other fish in the ocean resembles the “Purple Gladiator” with its most dangerous sword-like bill. Its larger eyes and the slash of its bill, make the Swordfish a feared predator. It is also the sole member of their family Xiphiidae. They are highly migratory, predatory fish characterized by a long, flat bill in contrast to the smooth, round bill of the marlins. It uses the bill as a weapon – to spear prey as well as for protection from its few natural predators. The mako shark is one of the rare sea creatures big enough and fast enough to chase down and prey on an adult swordfish. 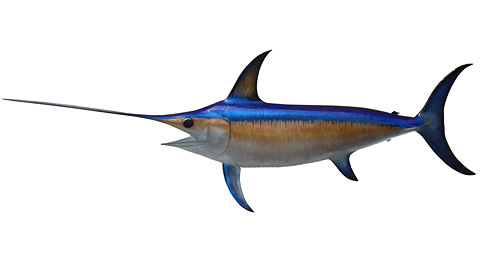 Swordfish are elongate, round-bodied, and lack teeth and scales as adults. They reach a maximum size of 14 ft (4.3 m) and 1,190 lb (540 kg). The International Game Fish Association’s all-tackle angling record is a 1,182 lb (536 kg) fish taken off Chile in 1953. At one time Swordfish reached well over a thousand pounds but it would appear that those days are for the moment over due to over fishing by commercial long-lines. A Swordfish that even weighs 400 pounds is rare and most angler caught Swordfish weigh from 90 to 200 pounds. Swordfish are distributed throughout the world’s marine ecosystem, in tropical, subtropical and temperate waters, between approximately 45° north and 45° south. They tend to concentrate where major ocean currents meet, and along temperature fronts. They inhabit the mixed surface waters where temperatures are greater than 15 °C but can also move and hunt in water as cool as 5 °C for short periods due to its capability to heat exchange organs which are able to increase the temperature of their brain and eyes by 10-15 °C.